I was sent this video by David Doyle and it shows how a young girl successfully prevented her own kidnapping. The topic children’s awareness / self-protection comes up here from time to time and I felt the video would be of interest and may prompt an interesting discussion of these issues. It probably goes without saying, but I'm sure like anyone else that is a parent (my daughter will be 3 in a couple of weeks) that video chills me to the core. I find it a tricky subject to tackle. On one hand you want your children to be friendly and confident with other people but also wary and switched on. Any ideas from other parents when or how they broached this kind of thing with their kids? What age you started it? Were there any unforeseen effects, a drop in confidence perhaps? My kids (9 and 5) are pretty naturally shy, so I'm usually teaching them how to be friendly in appropriate situations, rather than the other way around. I think "appropriate" is the key, though. Aged 3, she's still not out of your sight much, but it won't be too long until you'll need to let her "feel unsupervised" a bit. That's when you start teaching them the difference between "a trusted adult" and a stranger, and what level of interaction is appropriate in each case. I specify with my kids who is trusted. Uncle Scott can pick you up from school. So can Grandma. Nobody else. Do what your schoolteachers say. Do what I say. Do what the babysitter says. Anybody else tries to tell you to do something, you come get me. Someone says "Hello," you say, "Hello." That's just being nice. Someone you don't know tries holding a conversation, come get me. Anyone AT ALL tries to come close enough to touch you when I'm not present, come get me, and make a lot of noise while you're at it. That's a partial list of rules, anyway. Teach what actions are "appropriate" and how you want them to respond to "inappropriate" actions. I've never sat down and planned out any of this stuff. I bring it up to them when something brings it to my mind. (Like this video. I'll probably show it to them after school and we'll have a lesson.) When I start to talk about it, we usually review everything I can think of. Anyway, like the rest of parenting, you're smart, you'll figure it out. Or at least not screw it up too much. She's mainly going to learn by modeling your behavior, anyway. As a self-defense minded individual, she'll likely grow up that way, too. The walmart video struck a particular chord as when we go shopping my little one has a habit of running off, and on occasion has gone out of sight or ducked down an aisle and we've had to go and find her. Not finding her doesn't bear thinking about. One thing that really struck me becoming a parent was how many strangers come up and intereact with my daughter. I mean...she's cute as hell so it's understandable but it's annoying to have to deal with. At least 3 times I've had to tell people to back off as they crossed the line (rubbing her head or tickling her). No doubt with no ill intentions but just being clueless about what should be acceptable. 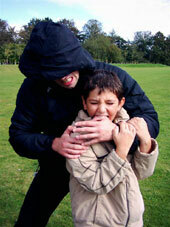 Everyone knows kids should be wary of strangers so why do they try and act so familiarly? In my study of the social sciences and of violent encounters, its amazing how often people let social pressure or the desire to not make a scene overpower their survival instict. I fear that a child may not feel totally comfortable with a stranger, but the fact that that stranger is an adult and is making a demand on that child may for certain children be enough for a kidnapping to happen. Yeah. I think predators count on this, both with kids and adults. Again, my approach has been to teach my kids what kind of behavior is "appropriate." Not appropriate for the kids, but what kind of behavior is appropriate for adults. Adults don't ask kids for help with something. Adults ask adults. Etc. I don't try to scare them, but I've been pretty straightforward about what can happen. What I've taught them is pretty similar to the "Stranger Danger" stuff they get at school, so it's reinforced there, too. Thanks for all the above posts. Great contributions that I feel visitors and members will enjoy reading. Thanks folks! Anyone who has yet to read them really should put that right. The video doesn't say the girl remembered her "stranger Danger" training" or had any, but it would be great if it did! The hosts could have suggested kids to take classes and it would be a boost for MA schools. Maybe it was in the local newspaper that said that?